by Godofredo U. Stuart Jr.
For the adventurous traveler, a trip to Quiapo will provide a taste of the third-world surreal and fringe, a merging of Filipino religiosity and the commerce of the alternative. Long before the surreal-and-fringe, Quiapo was a thriving fishing village, a complex of intersecting rivers, canals, and marshes, abundant with the water lily Kiapo, from which it derived its name. By the latter part of the 16th century, Quiapo had become a flourishing center of commerce, awash not merely of water lilies, but also of a profusion of crafts and trade stores, theaters and movie houses and open markets, attracting the elite, the 'illustrados' and the nouveau riche who came to build their luxurious homes and mansions. 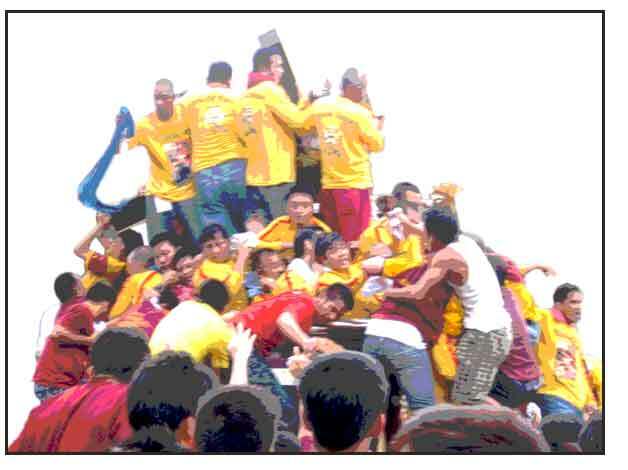 Part of the boom and burgeoning commerce was attributed to the Black Nazarene. Brought to the country by the Recollect Friars in the early 1600s, the Señor, the endearing name for the Black Nazarene, finally found permanent residence at the Quiapo Church, relegating its patron saint, St. John de Baptist to a demoted status, obscurity and lessened reverence. But time and change have ravaged Quiapo of that historical past. Now it stands transformed, a shadow of its gentrified past, its sole vestige, the Quiapo Church– razed many times by fires and earthquake, but always arising anew from those recurrent calamities– monolithic and towering over the miasma of third world commercialism that surrounds it. And housed within is the Black Nazarene, the main draw to the Quiapo Church. A wooden image that has spawned a culture of devotion and idolatry unlike any other in the Philippines, drawing countless devotees, mostly from the 'masa', but also from the ranks of the desperate professionals, crowding the church every Friday, paying homage in all piety, some in open humility, with desperate promises, walking on their knees to the altar – for a favor, for a miracle, for penance, for giving thanks. And around the church, an enclave of commerce prospers, an outdoor market that caters to the masa seeking bargains for its mundane needs, spiritual accoutrements and alternative necessities. The market under the bridge - "sa ilalim ng tulay" - is still a popular draw, where, with right kind of haggle, everything is cheaper than anywhere else. Carriedo is now a street market that stretches from end to end, blaring decibels of deafening music, mongering all sorts of "branded" imitations and pirate DVDs of current theater fares. 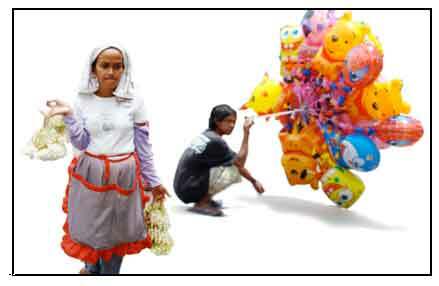 Beggars invariably materialize, drawn to the tourist-, charitable- and rich-looking visitors. For the appetite lined with fortitude, there is a wide choice of sidewalk and push-cart cuisine and native delicacies. And immediately abutting and circling the Quiapo church, there is the commerce for the devotees and the dabblers in the alternative. Almost any day finds the prayers, hymns, homilies, litanies and novenas spilling into the streets, and amplified into the edges of Raon's electronic commerce. 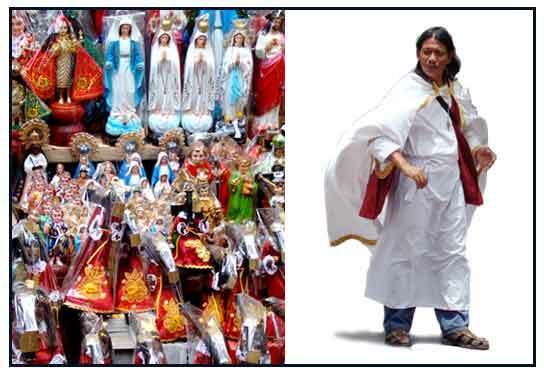 And on Fridays, Quiapo Day, the day of special homage to the Nazarene, the multitudes multiply. It becomes a carnival of sight, sounds and smell—a street theater of the crowding masa seeking options for their salvation needs, costumed penitents, faith healers, rows of palm readers and Tarot-shuffling fortune tellers, ballon-mongers, and flower vendors for altar offerings. A profusion of make-do stalls hawk a dizzying array of wares for the faithful and alternative rituals — candles in a variety of colors and shapes for specific spells and counter spells, incense, tawas, lotions and snake oils. Icons and cellophaned-wrapped figurines of the Sto. Niño, Nazarene, and the Virgin Mary in laminates, wood or plaster. Anting-antings, pendants and talismans. Rosaries in all sizes and prices. Leaves, twigs, sprigs, seeds, roots, juices or decoctions of herbal medicinal plants – fresh, dried or powdered, bundled, bottled or bagged, decocted for a sundry of day-to-day maladies or desperate needs. And in the air, a composite of odors, buried in each other, of urban pollution and refuse, burning candles, wilting medicinal plants, incense, and multitudinous sweat, intermittently relieved by doses of scents wafting from stringed sampaguitas. Outside the church, the faithful patiently shuffles in their long communion lines. Inside, they cram to the doors, many busily digesting the homily, some beading through rosaries in silent prayer, while some clutch at their cellphones frantically texting . . .their prayers. And outside, high above in a corner of the church facade, lords a a giant flat-screen LCD television from which the priest renders his hymns and homily, and after the services, replaced by a static image of the Nazarene, probably pondering this festival of prayer and commerce. Time was, Quiapo's renown was not just the Church and the Nazarene. There was also Plaza Miranda, the square that abuts the church, site of political rallies and "meeting de avances." It was the place that provided a stage for the voices of dissent, the freedom to discourse and debate. President Ramon Magsaysay once uttered: "Can we defend this in Plaza Miranda?" There was a time when the question resounded as affirmation for the ideas and the freedoms Plaza Miranda stood for. But so suddenly, it came to an end. August 21, 1971, during the Liberal Party's political campaign rally, two hand grenades tossed on-stage claimed the life of a 5-year old child and Manila Times photographer Ben Roxas, and left scores injured in its wake. It was Plaza Miranda's death knell. Initially, the incumbent President Marcos was blamed. In turn, he blamed the communists, and suspended the writ of habeas corpus, and soon after, declared Martial Law. In the aftermath, Plaza Miranda ceased to be. Now it stands a historical footnote, refurbished by architectural facelifts, adorned with plaques and sculptures that celebrate its past - a past probably lost to the masa's recurring street theater of religion and the alternative. In January, the annual procession honoring the Black Nazarene is held. Quiapo is what remains of that triumvirate of a more glorious past – Escolta, Sta. Cruz, and Quiapo – that once veritable "downtown" destination for the shopping and movie-house needs of the burgis and the studentry of the university belt. And for Quiapo, the church is what remains, anchor to its perimeter of thriving third-world commerce. 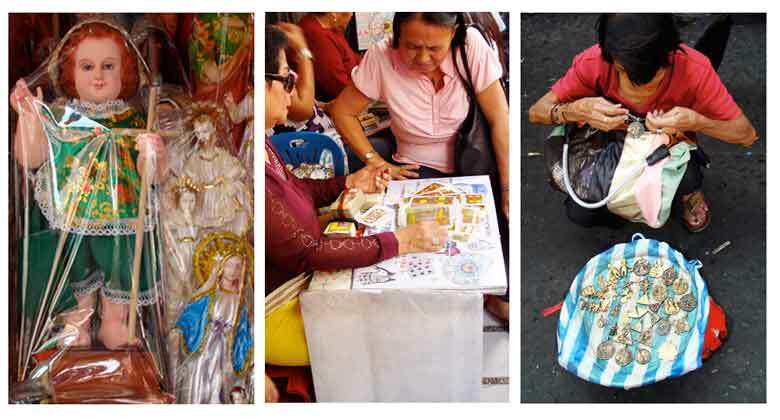 And for the intrepid traveler or the peripatetic soul with a little daring, for the flavor of the fringe and a fascinating window to a culture, any Friday is worth that half-day trip and venture to Quiapo. A wonderful historical and field guide to Quiapo and the Black Nazarene culture.